One of the built-in features of OS X Lion, and previous versions is the chat application known as iChat which has always been billed as a fully featured instant messaging application which combines text, video and voice chat into one app. iChat has always been a very versatile application offering powerful features supported by the fact that it works with a number of services such as Yahoo and the largest instant messaging community in the United States, AIM. As we all know, however, every piece of software has its shelf life and it seems as though that time has come for the popular iChat application. Apple have today released a beta version of the new ‘Messages’ application which will ship with the revamped Mac OS X Mountain Lion in the Summer. 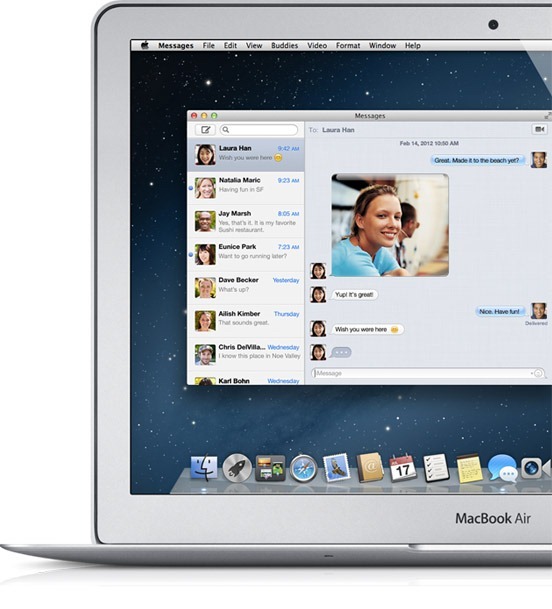 Messages is available to download today and totally replaces any existing installation of iChat on a user’s Mac, giving a taste of what is to come with the release of Mountain Lion. Worry not, if you are a regular user of the iChat service it will still continue to work in the new Messages app, but along with additional built-in features. Unlimited messages to any Mac, iPhone, iPod touch or iPad. Start a conversation on your Mac and continue on any other device as it syncs between them all. The ability to send photos, videos and voice attachments between devices. Invoke a Facetime call from within the Messages application. Continue to use additional services such as AIM, Yahoo and Google as they are all built in to Messages. The messages application for Mac was obviously the next step in the iMessage revolution, just as we seen with the FaceTime for Mac application which shows Apple are committed to having maximum, cross device compatibility where possible and is further evidence of Mac OS X and iOS fusing together to form a unified OS. The Messages app is currently in beta and can be downloaded from the official Apple website free of charge. UPDATE: Here’s the official direct download link of Messages Beta.